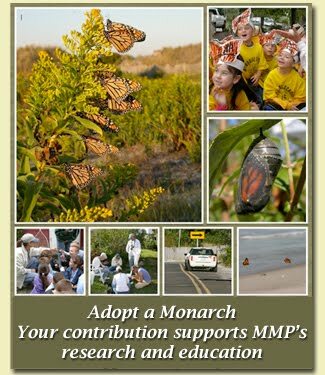 Cape May Monarch Monitoring Project: Monarch Nursery in the CMBO & Info on How to Make Your Own! Monarch Nursery in the CMBO & Info on How to Make Your Own! As most people know, there are a few life stages of a monarch butterfly: egg, larvae, chrysalis, and adult. But how often do people get to witness the metamorphosis and incredible transformation of a "baby" monarch into an adult? Today, while setting up some caterpillar tanks, which I am renaming the "monarch nursery" at the Cape May Bird Observatory, I had visitors appalled at small size of caterpillar eggs and in disbelief that I was actually able to locate them in a garden patch of milkweed. They are visible to the human eye, however the small yellow speck can be easily missed by the average person if they don't know what they are looking for. Even more incredible is the small size of a day old caterpillar- so small you almost need a magnifying glass to tell what it is. Well it's that time of year again... it's probably the last reproductive cycle of monarchs up here in the north east. As soon as temperatures begin to drop (surprising that will happen with the crazy summer weather we've been having!) monarchs will halt their reproduction and newly emerged "Mexicans" will start to prepare for their long journey. It's almost backwards how this generation gets to enjoy existing for reproduction purposes.. yet it isn't them, but their kids that will be taking the honeymoon for them. You too can raise caterpillars of your own. With the expected drops in monarch numbers this season, it's more important than ever that newly hatched caterpillars toughen up and survive their life changes to becoming a butterfly. The great quantities of caterpillars growing and eggs being laid is giving us some hope that monarch numbers in Cape May can partially be restored. If you have milkweed of your own, it's possible you will have eggs or caterpillars in your garden. Eggs are small and yellow, they are commonly laid on the underside of milkweed leaves. Caterpillars are black and tiny when they first emerge, and become yellow, white, and black striped as they shed their skin and mature into a new "instar". Milkweed should be fresh for caterpillars to eat it and remember that milkweed is a monarch's only "host" plant, meaning it is the only thing the caterpillars will eat. To be kept fresh, milkweed should be snipped and put in water.. but the bowl or cup of water must be covered because caterpillars are clumsy.. and they can't swim! (Louise's creative idea is to use a mason jar, cover it with plastic cling wrap and put the screw on ring back on. Poke holes just big enough for the stalk to fit, prop it up, and there you go, done! Same thing can be done with tupperware containers, plastic wrap and rubber bands to hold it). An empty fish tank, critter keeper, or any storage container will make a great caterpillar house, but remember that eventually those caterpillars will be able to climb so your container but have a lid (but holes so they can breathe!). Caterpillars do not need water; they get all the water and nutrients they need from the milkweed plant. Remember to feed your caterpillars fresh milkweed every day. For about 2 weeks they will eat, and grow, shedding their skin a total of 5 times as they do this. When they are ready to form a chrysalis they will start searching for a place to make one, (most likely the lid of the container they are in) and form a "J" while hanging upside down. Once they form a chrysalis it will take about one and a half to two weeks for them to become a butterfly. The warmer it is, the quicker it will develop. You know they are ready to emerge when the chrysalis turns black, and then transparent so you can see the butterfly inside. Once the butterfly emerges it will take about an hour for the wings to dry and be ready for flying. When it's ready, you can release your monarch outside to be a part of the magnificent migration this season! Raising butterflies is very simple, enjoyable and also addicting for people of all ages.. you don't need to be a kid to appreciate their magnificence and mystery in a truly amazing metamorphosis (although raising butterflies with kids is a very educational and fun-filled process). Just make sure to have a constant supply of milkweed to feed your caterpillars every day for 2 weeks! If they run out of food, they will not survive. Raising your caterpillars straight from the eggs is the best way to ensure they are healthy and don't pose a risk of parasites (some insects actually use the monarch caterpillars to feed on and grow as part of their own life cycle.. I'll leave this topic for another future post). Parasitism in monarchs is a very upsetting and heart-breaking part of the natural process.. not all individuals can survive, but the only way to guarantee YOURS will is protect each monarch from birth... or in other words from an egg. However, if big caterpillars are all you can find, it's still fun to raise them, most of them should be healthy and this way the full process to getting a butterfly will be much quicker! So there you have it- that's how you raise them, and it's exactly what we are doing right now in the Cape May Bird Observatory. We are just getting started though... with 3 young caterpillars, 6 newly emerged day old caterpillars, and about 20 eggs. Come see for yourself, our very own "monarch nursery" where we are raising baby monarchs in their own safe haven with plenty of food, protection, and love. Right now they are still very tiny but over the next few weeks they will be forming their way into adulthood, and will be tagged and released into the world to make the incredible journey all the way to Mexico. How cool would be it be to have a hand-raised monarch be one of the ones to make the whole journey? We sure can't wait to find out! Come check out the tanks, and our new bulletin board in the Cape May Bird Observatory, Northwood Center at 701 East Lake Drive, Cape May Point NJ. The board is full of monarch information, literary research, data, and pictures and will be updated often as new information is gathered. If you have any questions at all about our set-up or how to raise monarchs on your own, feel free to message the Facebook page at www.facebook.com/CMMonarchs. First Demo of the Season was a Hit! The Monarch Season Has Officially Begun!